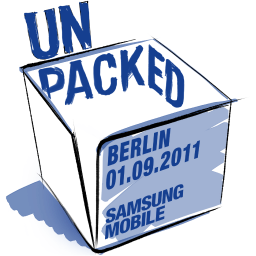 Buried deep within Samsung's Unpacked app is evidence of a few upcoming devices set to be announced at the IFA conference in Berlin, which begins on September 1st. Among the outed devices are two new additions to the Galaxy line, the Galaxy Tab 7.7 and the Galaxy Note. As you might expect, the Galaxy Tab 7.7 will most likely be a 7.7 inch tablet, judging by the naming guidelines set in place by the Tab 10.1 and Tab 8.9. The device will most likely pack similar specs to its big brothers and run Honeycomb 3.2, since it's designed to work well with smaller screens. The Galaxy Note, on the other hand, doesn't provide a namesake that's as open about its form or function. In all honestly, it's hard to say what this device will be, or if it will even be running Android. Samsung urges everyone to update the Unpacked App on September 1st, so it's probably safe to assume that full details for all of its upcoming devices will be available at that point. Hit the widgets below to grab the appropriate app for your device.